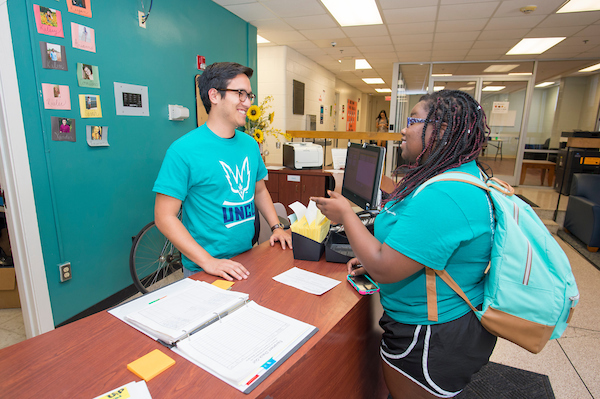 As you become more familiar with your new home, you will learn to take advantage of the many services and facilities that UNCW offers. Our main priority is in making your transition into your on-campus residence as seamless as possible. Listed below are descriptions of the services and facilities offered to you as an on-campus resident. Cable TV is available to all on-campus students. Basic cable channels are included in the room rental and students are responsible for providing the coaxial cable from the outlet to the TV. Cable access is available in all UNCW residence hall rooms, the University Suites and the University Apartments. Cable issues should be reported be submitted a TAC ticket via the service catalog https://uncw.edu/ITSD/living/cabletv.html. To receive all channels, televisions must have a digital QAM/ATSC tuner. In accordance with the FCC regulations and our cable contract, no splicing or splitting of cable to other rooms is permitted. Should the university face fines or other action as a result of FCC regulations because of a student found splicing cable, we reserve the right to seek appropriate action and restitution. According to FCC regulations, fines can be up to $1,000.00 per occurrence. Each student is issued a mailbox to receive both personal mail and campus correspondence. Students living in Seahawk Crossing have mailboxes located in Seahawk Crossing Building 3, while Seahawk Landing residents can find their boxes in Seahawk Landing Building 2. All other students have mailboxes located in the Fisher University Union. You may pick up your mailbox address and combination from Postal Services when you arrive on campus. UNCW has extensive wireless Internet coverage on campus, and students will be provided with a password to access it upon arrival. Due to high wireless usage in the residence halls, it is recommended that students plug into the wired Ethernet port provided in their rooms for the fastest connection. Students should bring an Ethernet cable with them, or they can purchase one on campus at TAC Repairs in Randall Library. If purchasing a new computer UNCW offers student discounts on Apple and Dell computers and also on Microsoft Office and Windows software. 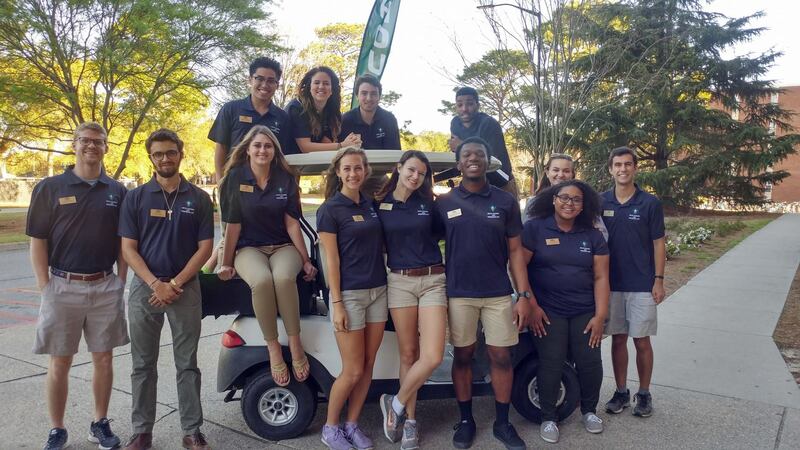 UNCW has guidelines for the appropriate use of university resources which can be found in the Responsible Use of Electronics Resources policy. It is important that students abstain from illegal downloading and sharing of copyrighted music, video and film to prevent revocation of Internet and computer privileges. More about illegal file sharing at UNCW. The Technology Assistance Center (TAC) is available for all technology issues including helping students with Internet connections in their residence hall rooms. Please search the AskTAC knowledgebase for UNCW solutions 24 hours a day. The Front Desk, staffed with a 24-hour Desk Receptionist (DR), is the place where residents may check-out hall equipment, sign for loaner keys and report facility problems. The Front Desk also serves as an informational center for your building. Front Desk staff may be reduced during holiday hours when student occupancy is lower. All desks can be found in the residence hall's lobby except for the (University Suites which is located in Schwartz Hall). In the Seahawk apartment communities, the Crossing desk is located in building two, the Landing desk is located in building 6, and the Village desk is located in the clubhouse. Health and Safety Inspections are conducted by your Residence Coordinator, the Director of Environmental Health and Safety and a facilities staff member. The inspection ensures that each room is in a sanitary and safe condition. These inspections will occur each semester. Rooms that are unacceptably dirty and/or unhealthy will be cleaned by university personnel and the residents will be charged a minimum of $25.00 for trash removal and $25.00 for room cleaning. A Residence Coordinator will generally follow up on citations after 48 hours of issuance. Any infraction in plain view is subject to documentation and ultimately may be referred through the campus judicial system. Please keep your rooms reasonably clean at all times to avoid this unpleasant possibility. Belk Hall, Graham-Hewlett Halls, and University Suites have housekeepers that clean student bathrooms weekly and common areas are cleaned daily in these areas (except for University Suites). Schwartz Hall, Keystone and Innovation House, and Cornerstone Hall have housekeepers that clean student bathrooms and common areas daily. Seahawk Crossing, Landing, and Village have common areas that are all cleaned daily. The cleaning service for residence halls includes the lobbies, hallways, public areas, laundry rooms and student bathrooms. iPrint machines are located in each of our residential facilities in order to serve your printing needs. For more information about how to use iPrint and find locations please visit www.uncw.edu/iprint. 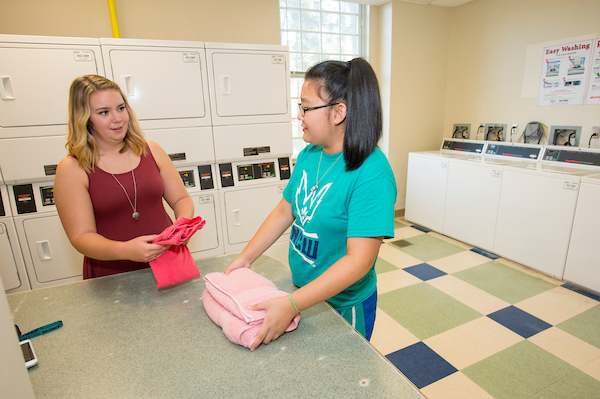 Laundry and vending (soda and snack machines) facilities are provided in all residence hall areas. Use of laundry equipment is included in room rates. We have the best laundry service provider available and the best commercial laundry equipment the market will bear. Problems with vending services should be reported to the Auxiliary Services Office at (910) 962-3178. For laundry issues either report to this link or place a maintenance request. All students have the ability to place thier own Maintenance Request online by visiting www.uncw.edu/housing/maintenancerequest.html. Facility Emergencies should be called in immediately to the Residence Hall Front Desk or to their assigned Resident Assistant/or Staff on Duty. Students are allowed to bring their own refrigerators and/or microwaves to use in their rooms when they move in. 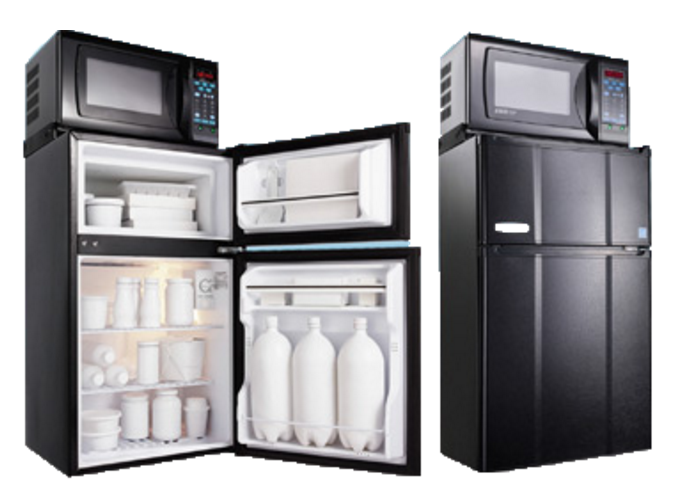 Refrigerators cannot be larger than 4.9 cubic feet. Additionally, Housing & Residence Life has partnered with Standards For Living to supply students with MicroFridge units. The MicroFridge is an energy efficient, Energy Star rated combination appliance, featuring a refrigerator/freezer and microwave oven with a patented electrical system. Renting a MicroFridge unit instead of bringing their own refrigerator is a practical and energy efficient option. To find out how to rent a MicroFridge, refer to the following link: Standards For Living. For local calls, dial 9 + (7-digit phone number). Campus calls only require that you dial the last five digits; For example the housing number (910) 962-3241 would be x23241. Local service is provided as part of your room cost; however, students are required to provide their own telephone instruments. Cordless phones may not function properly with the university's telephone switch. International long distance service is available to UNCW students only by using an international calling card. These cards can be purchased from any local retailer that carries them. The University does not sell international calling cards on campus. Any type of nuisance or annoyance calls are considered serious, and students who make such calls will be subject to University Disciplinary Action. Students who receive such calls should note the date, time and nature of the calls and report it immediately to a Resident Assistant or the University Police. UNCW prohibits the charging of telephone calls to campus telephone numbers. The University's Judicial Committee will handle any disciplinary action necessary.